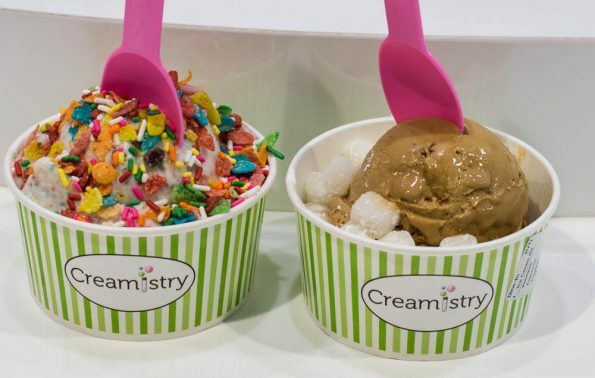 Creamistry’s third Arizona location is set to open this month at 44th Street and Indian school—here’s all the sweet details! Dec 10 Free Ice Cream Day (free small, no toppings) from 12 pm- 2 pm. Fri-Sat 12:00 p.m.- 11 p.m.
Creamistry has a unique take on creating the perfect ice cream treat. Customers choose a size or specialty (ranging from shakes to floats to waffle bowls and more), next they select an ice cream base (including premium, organic, Greek yogurt, non-dairy, vegan and gluten free options including sorbet and coconut milk) and one of nearly 40 flavors (ranging from birthday cake to sea salt caramel to Madagascar vanilla bean or blood orange sorbet) and finally they select toppings (candy, fruit, nuts, cookies/cake). Everything is mixed with liquid nitrogen for a smoky and satisfying visual showcase. Science and dessert collide at this ice cream shop founded in California in 2013. Ice cream treats are flash frozen using liquid nitrogen and over 70 flavors and toppings. Arizona locations of this innovative franchise will open throughout 2016 and beyond. For more information, visit www.creamistry.com.